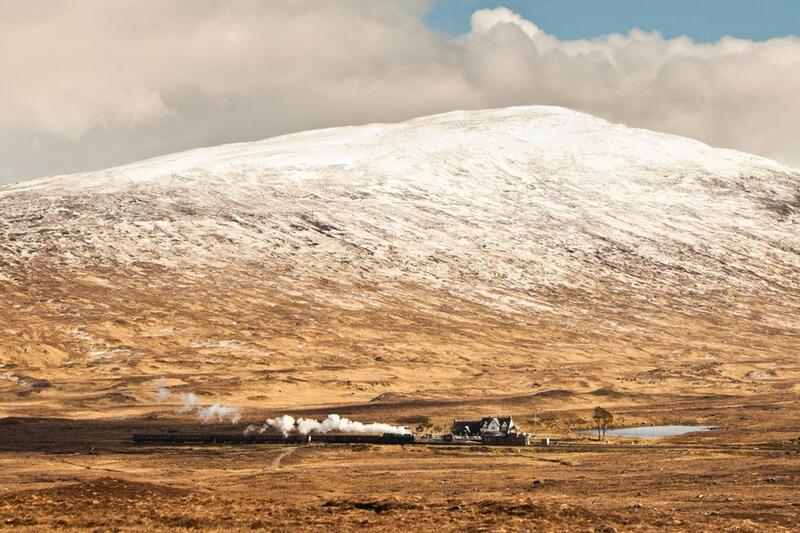 Explore the Scottish Highlands by train and on foot. Combine a walk along the UK's most famous national trail, the West Highland Way, with one of the 'World's Best Train Journeys' on a journey through Scotland's western Highlands. 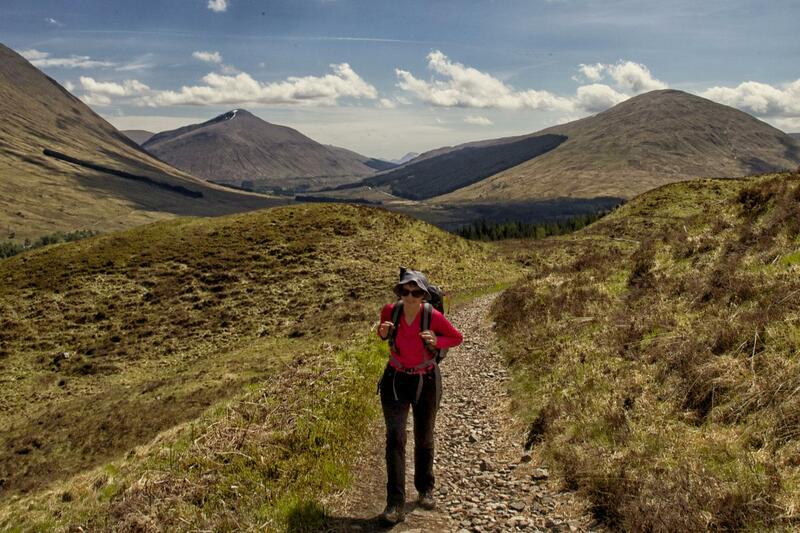 This rail and hike adventure will take you past mountains, forests, lochs and glens, including a boat trip on Loch Lomond, before reaching Fort William at the foot of Britain's tallest mountain, Ben Nevis. 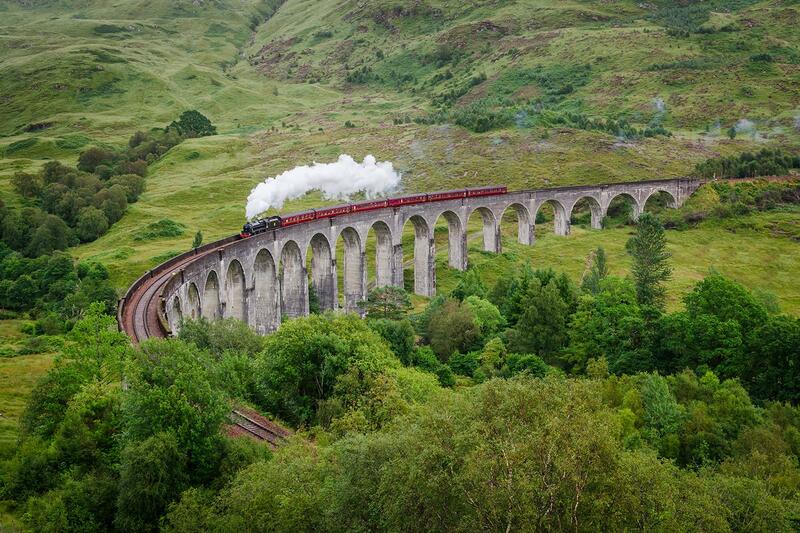 A fitting finale to your trip is a train ride on the 'Jacobite' steam train, also known as the 'Hogwarts Express'. Mallaig is the gateway to the Isle of Skye and a temptation for further adventures. Your tour starts in Glasgow at Queen Street railway station. 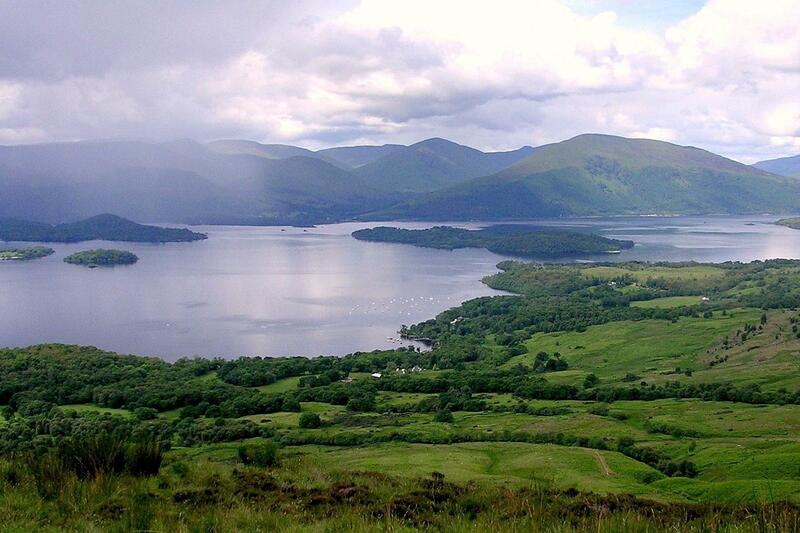 Once aboard the West Highland Line train you will travel north towards Loch Lomond. Pulling into Ardlui station, you have arrived in the Highlands. Enjoy your first evening with a sun downer on the loch shore and look north to the peaks that will frame your followings day’s walk along the West Highland Way. Your day begins with a short ferry ride across the waters of Loch Lomond to Ardleish on the Easter Shores. 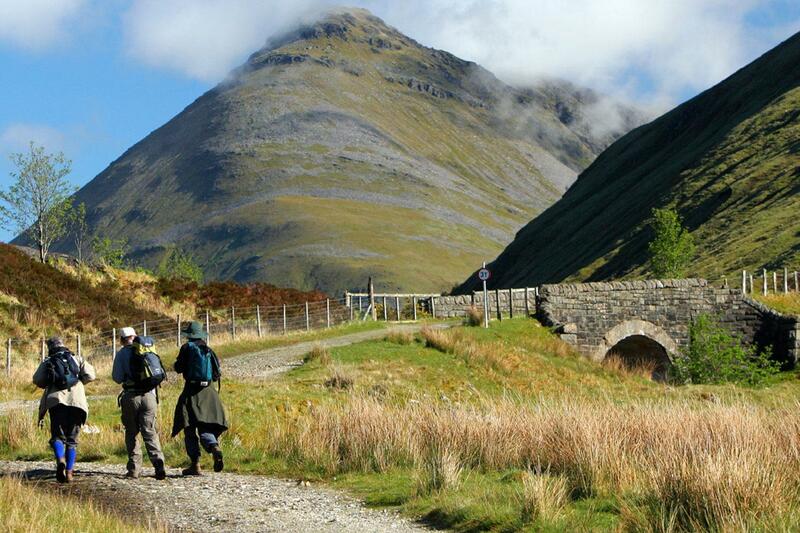 You are now on the West Highland Way and your walk takes you north through Glen Falloch. You may glimpse the roe deer on the mountains. After heavy rain the sheer slopes of the glen gush with the turbulent waterfalls that brighten up even the most cloudy day. Passing through the conifer forests you enter the Glen of Strath Fillan to arrive at the village of Crianlarich. 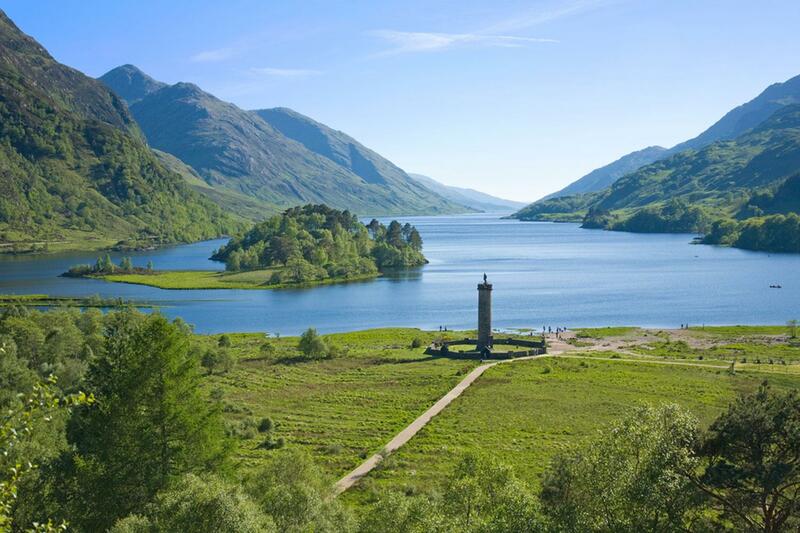 Commencing with a gentle start through the verdant Strath Fillan, you will walk the footsteps of St Fillan, a 8th century Irish evangelist whose subsequent cult attracted Robert the Bruce as one of his followers. Passing through the ruins of his chapel you move through Dalrigh, the 'King’s Field’, where legend has it Robert the Bruce suffered defeat in 1306. Following the ‘Way’ amidst the sky scraping mountain scenery of Beinn Odhar and Beinn Dorain you descend to Bridge of Orchy. After breakfast you have the option of a 5 mile loop walk to the shores of Loch Tulla. 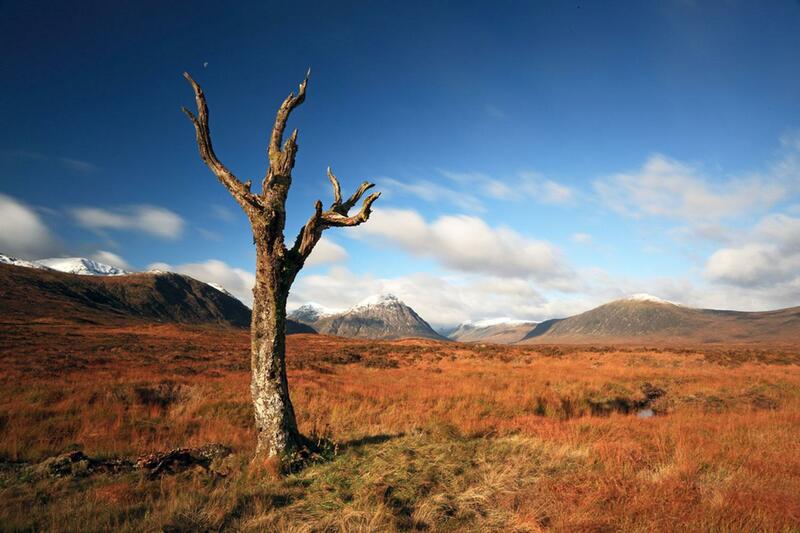 with uninterrupted views across the loch, wild Rannoch Moor and the Black Mount. A relaxing afternoon follows as you board the West Highland Line to head across Rannoch Moor. Crossing a wide remote expanse of the Rannoch Plateau at 300m above sea level. This is a wild landscape of peat bogs, lochans and ancient forests, home now to herds of red deer. Passing Loch Treig the line descends into fertile Glen Spean and the Great Glen. Entering a forest trail to start your walk it is worth keeping an eye out for red squirrels. The dominating feature of the walk is Ben Nevis, Britain’s highest mountain at 1344m which reveals its massive bulk in full as you near Fort William. Passing in its shadow you enter the town to complete your walk. With two nights in Fort William you may wish to tackle Ben Nevis with a self guided walk to the summit via the ‘Tourist Route’. Suitably equipped for the ever-changing conditions you may be rewarded with far ranging views from the summit plateau. 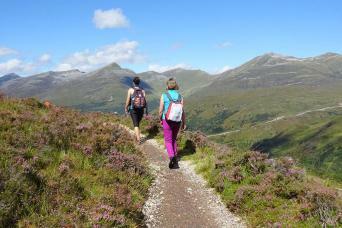 For a low level adventure, the Glen Nevis trails are a delight. One of the best short walks in Scotland, the rocky path through the Nevis gorge to the cascading Steall Falls, is highly recommended. A real treat is in store today with a trip on the ‘Jacobite’ steam train from Fort William out to the west coast port of Mallaig. A highlight of the journey is crossing the 21 arches of the Glenfinnan viaduct. While having gained recent fame through the ‘Harry Potter’ films, the location is historically important as the landing point of Bonnie Prince Charlie in 1745 for his Jacobite uprising. The dramatic scenery continues with summits towering over 700m above the tracks as you puff and whistle through the passes. Reaching the wild rocky and rugged west coast with views across to the small isles of Rum and Eigg. The train brings you into the vibrant port of Mallaig which is also the perfect starting point for a trip out onto the Isle of Skye, only a 30 minute ferry ride away. Your tour ends after breakfast. You may wish to travel south via the West Highland Line (approx. 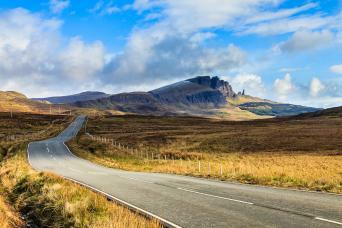 5hrs 30mins by train to Glasgow) or continue your adventures up into the Isle of Skye and beyond. Our West Highland Line - Rail & Hike holidays include overnight accommodation in a mix of 2, 3 and 4 star country inns, hotels, guesthouses and B&B’s. The accommodation we use most often is listed below. We book en suite rooms as standard. If there are no en suite rooms available in an overnight location, we may book a room with shared facilities, but we would always inform you in advance if this was the case. If you would prefer a little extra luxury whilst in Fort William, Spean Bridge or Mallaig you can upgrade to our hotel accommodation option. For this option we use a selection of country hotels, luxury bed and breakfasts and country inns of character. We will always try and accommodate you at the locations detailed in your itinerary. Occasionally, because of limited availability, we may have to accommodate you at an alternative location. In the unlikely event that we have to accommodate you elsewhere we will advise you of this before confirming your booking and arrange transfers to and from your overnight accommodation at our expense. This holiday is available to solo walkers, although a single supplement is payable. If you require single rooms within your party we would be happy to accommodate your request, although it is not generally possible to secure more than three single rooms in a party. A single supplement is payable. Breakfast is included each morning while lunch and dinner are not included so you are free to choose from the available options. Your accommodation will be more than happy to provide a packed lunch on request and this can be booked on arrival, alternatively your guidebook also includes details of local shops and convenient lunch stops on the way. Dinner is available either at your accommodation or nearby pubs and restaurants and your info pack will of course have recommendations. Your bags will be collected from your accommodation on each walking day and moved onto your overnight accommodation. We ask you to limit your luggage to one bag of up to 18kg per person. On the rail days we ask that you take all your baggage with you aboard the train. Although not exhaustive these are the accommodation providers we use most often. 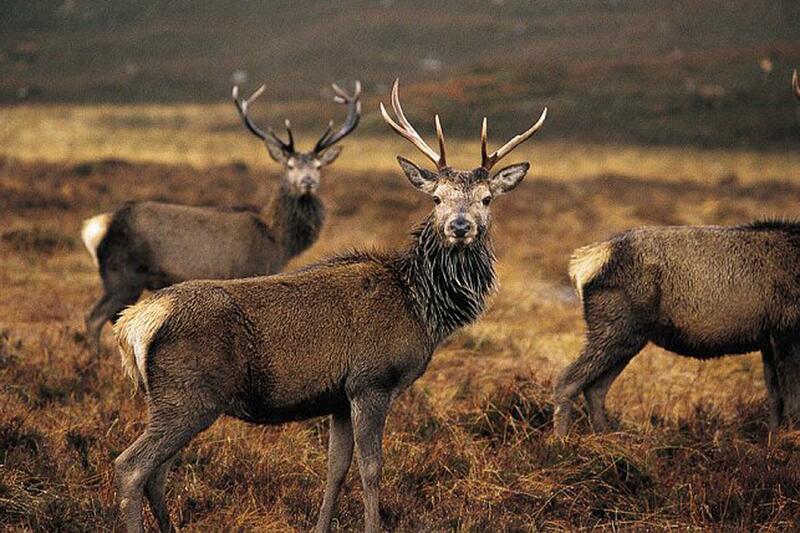 The Ardlui Hotel is located in the heart of Scotland's first National Park - Loch Lomond & the Trossachs National Park. This is an award winning, comfortable and well-appointed 36 bedroom, 3-star hotel set in the lovely village of Crianlarich. The Bridge of Orchy welcome their guests with personalised service, imaginative Scottish cuisine, quietly elegant en suite bedrooms and public rooms, intimate atmosphere. Peter and Lesley McIntosh extend a warm welcome to you from their family run guest house. Distant Hills is an established family run guest house, set in extensive grounds and located at the edge of a quiet Highland village. Myrtle Bank is a warm and pleasant establishment which overlooks Loch Linnie and is just a short stroll from the Town. Dora will welcome you in to her wonderful property which is extremely highly rated by clients. 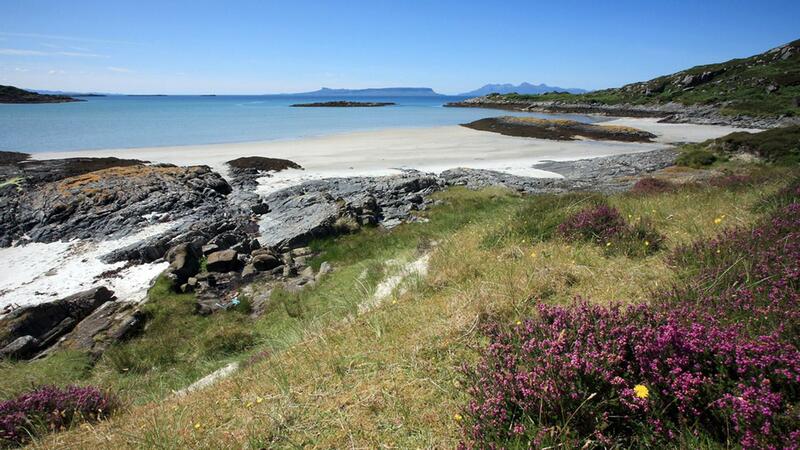 Seaview is a lovely family-run detached guest house in the centre of Mallaig. Fiona will provide you with a warm Highland welcome in this comfortable and relaxing bed and breakfast accommodation. It is ideally situated in Mallaig, overlooking the harbour and just a short walk from the train station. The West Highland Hotel retains the traditional charm of an age gone by and combines this with comfortable, modern en suite rooms. The view across the bay is spectacular and you are assured a warm welcome and a comfortable night in this lovely property. There are a few dates throughout the year when events in the local area will prevent us from being able to book accommodation. If you could schedule your trip around these dates it would be extremely beneficial. This trip is available to solo walkers, although a single supplement is payable. If you require single rooms within your party we would be happy to accommodate your request, although it is not generally possible to secure more than three single rooms in a party. A single supplement is payable. This trip is graded easy to moderate and includes daily walks of between 8 - 13 miles. The terrain may be rugged underfoot with some hills but not too strenuous. Perfect for those with a relatively good level of fitness. The route is generally well way marked and easy to follow. We supply a detailed map and route notes so you will easily find your way. Your bags will be collected from your accommodation each day and moved onto your overnight accommodation. We ask you to limit your luggage to one bag of up to 18kg per person. When you travel with public transport you take your luggage with you. By Air: Located 8 miles west of Glasgow, Glasgow International Airport is served by routes from around Britain and the world. A regular shuttle bus service runs to the city centre. 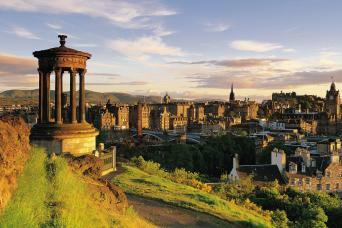 By Train: Glasgow has excellent rail links from within the UK. It is important to book as far in advance as possible to get the best fares. For information on all routes contact National Rail Enquires. By Bus: Services from UK destinations are operated by National Express. By Car: Glasgow is served by an excellent motorway network. Long term parking is generally available in the city centres. For directions and journey planner visit the mulitimap weblink. By Train: Following completion of your holiday you may wish to return toward Glasgow via the West Highland Line. Journey time is approximately 5hrs 30mins. For information on all routes contact National Rail Enquiries. By Ferry: For onward travel to Skye you may take the Caledonian MacBrayne ferry to Armadale. Crossing time is approximately 30 minutes. For information on all routes contact Caledonian MacBrayne. For detailed public transport information see Traveline Scotland. Planning a trip can be daunting, especially if this is your first long distance walking holiday. We are often asked the following questions and I hope that you will find the answers useful. With 42 miles of walking this is a fair distance and the higher your level of fitness the more you will enjoy the experience. You should be comfortable walking on good tracks and paths over undulating terrain for up to 7 hours. If you currently don’t enjoy that level of fitness, regular walking in hilly terrain supplemented by cardiovascular exercise for at least six months before your walk is recommended. A good gym or personal trainer will be able to draw up a personalised training programme. We suggest you book as soon as your plans are finalised as the region is extremely popular especially over May/June and July/August. You will find up to date availability on our website and we will always try and accommodate your plans. Traditionally May has always been the most popular time of year because the theory goes that the weather is better and the midges have not yet appeared. Although having walked in every summer month I believe any time between late May and October offers a wonderful experience. You can use public transport or local taxis to move you to the next overnight stop. Full details are included in your info pack. Do you move the bags from place to place or do we? You will be required to do both on our Rail and Hike itineraries, and on some days you will be required to take your bags with you or you receive baggage handling to your next walking location! Please check and refer to your specific Rail and Hike itinerary on our website, and visit the ‘Included’ section for clarification on this. It was our fourth time with Macs and once again our trip was perfectly organised. The information pack was as always very informative and helpful. We also enjoyed all of the acommodations and had nothing to fault during our trip. The hiking days were great, the scenerey is beautiful and changes troughout. We never did the WHW in full but we think that this trip is a very good introduction to it. We made a devation from our planned route on the last hiking day from Spean Bridge to Fort William (which would follow a stretch of the East Highland Way but we were not keen on walking mainly trough lots of woodland areas). Instead we decided to walk from Spean Bridge to Gairlochy trough the Glean Spean, wich is a 4 mile detour (approx. 1 1/2 hours). From Gairlochy we then took the first strech of the Great Glen Way to Fort William. We enjoyed the day and were satisfied with our decision. Especially the part trough Glen Spean is great with stunning scenery (you follow a path which was an old railway line). Also the Train Journeys are very enjoyable. A big plus is, that the tickets are day tickets and not for a specific train / time. That allows you to plan your journeys more flexible. The scenery on the West Highland Line trough Loch Lomond or Rannoch Moor for example is just fantastic. This includes the "Jacobite Steam Train" from Fort William to Mallaig, great scenery altough it was extremly busy, so be aware that there lots of people with you and Mallaig is very, very crowded until the train goes back back to Fort William around two o'clock in the afternoon. The ride itself was exciting nevertheless. We combined our trip with the "Skye Highs Short Break", so after an overnight in Maillaig we took the Ferry to Skye instead of travelling back. We enjyoed our time there an can highly recommend it as well. This was a big deal for me since I never hike. I'm a dancer, not a hiker so I had to get a lot of gear. Hiking shoes, backpack, rain coat and rain pants, wool socks, fleece jacket, etc. Plus I'm use to 80-90 degrees in Hawaii, so I had no idea how cold 40-65 would be. I found I usually got hot hiking. Wear layers as you will peel them off and put them back on again. I did fine, but the 10-12 mile hikes were a push for me. I loaded music on my phone and listened while I hiked when I needed a pick me up. Also a small flask w whisky really helps when you are fading towards the end. Good hiking shoes and good socks are critical! Also critical is to load MAC adventure app on your phone and scan the hike routes so you can follow the trail on your phone and know when you've taken a wrong turn - which did happen! I did this trip alone and I would not suggest doing that. I met 4 ladies my first day and we hiked together the whole way. The last day hiking to Fort William, it rained and got cold and we saw no other people on the trail the whole way. We took a wrong turn once and went 1/2 mile out of the way til we discovered - because of the downloaded trail scan - that we needed to go back. It is possible to get lost, wet, cold, tired and in trouble. For this reason I do not suggest doing it alone and to take a phone loaded w the trail scan. If you follow these pro-cautions you'll be fine. The countryside is beautiful. And if you have the right gear, the rain is not a problem. The packed lunches were plenty. Bring 1-2 bottles of water. I put electrolytes in one bottle. The hotels, most of them, were very nice. I give high ratings to The Bridge of Orchy Hotel and Myrtle Bank. The breakfasts are huge. The Scots love to feed you haggis and black pudding. Try it! We did fine gourmet dining almost every night and after dinner whisky. It was a great adventure. One last tip, bring a light suitcase as you have to carry or roll it (uphill) to train somedays. Our party of four had an amazing time walking and riding through the highlands. The combination of hiking days and rail days made it more manageable for us "weekend warriors". The accommodations were very comfortable and relaxing. We ate dinner at each of the hotels and were impressed with the quality of the menus. All but one of the hotel staffs were incredibly inviting and warm. The one that most impressed us was the Bridge of Orchy Hotel. The entire staff was wonderful but particularly Maria, the "co-manager", whose charming personality and generosity made us feel like old friends. And Ken at Old Pines in Spean Bridge was very helpful, even giving us a ride to the trail head instead of having to share the narrow road with cars (We deviated from the plan there and took the Great Glen Way to Ft. William instead of the West Highland Way because one of us wanted to see the lochs along the Caledonian Canal). The rail days gave us time to do some exploring in the towns and surrounding area on our own. After our MacAdventure tour ended we went up to Inverness, and from there to Edinburgh. We have so many gorgeous pictures of our days in the highlands, which were unusually blessed by clear blue skies! We all loved every minute and were sad to have to go home. Great time on the West Highland Way and in the Highlands! Wonderful mix of expert planning and support (e.g., luggage transfer, maps, help in designing a tailor-made itinerary) - and the freedom and independence of just being on our own for the actual travel. 8D7N Rail & Hike was well-organized and coordinated. We liked all accommodation as they are comfortable and locations near to train stations making them convenient for us. We would book trip earlier as June is still peak period and we understand there were some difficulty booking accommodation. E.g. We would have liked to stay at Ardlui Hotel so as to enjoy Loch Lomond. Also staying at Bridge of Orchy instead of coming bck to Tyndrum. But of course, we appreciated the seamless transfers and comfy B&Bs arranged. In all, it was a good trip and we enjoyed WHW. 1. The code for the traintickets didn't work. I received the right code in a couple of minutes by E-mail. 2. The journey ends in Mallaig. The train journey to Glasgow takes more than 5 hours. we needed an extra night in Glasgow for our flight home. 3. Train time tables are very accurate. The West HIghland Way Train & Hike offers stunning views and some lovely walks and some of the best accommodation we've ever stayed in. However, the paths are rocky and there are long stretches of hard/rocky path making for an exhausting experience and we saw several walkers struggling especially as it was unseasonably warm in May! There are long stretches without anywhere to get food or water (on the East Highand Way we came across a large cooler full of drinks and snacks with an honesty box!). At the end of the West Highland Way it is still a long walk into Mallaigh to reach the 'new' end which you have to take into consideration! If you love the idea of watching the Scottish Highland landscape unfold from the comfort of the West Highland train line, coupled with walking the most famous of Scotland’s national trails then this the trip for you.